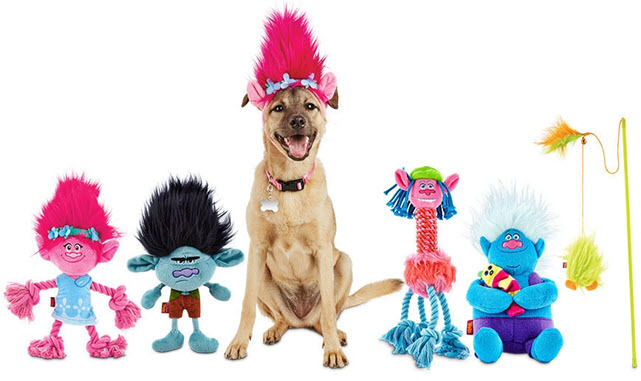 Petco has unveiled a line of pet toys inspired by Troll dolls and the upcoming DreamWorks animated film Trolls. The collection features key characters from the upcoming movie, including Poppy, Branch, Biggie and his pet worm, Mr. Dinkles. Rebecca Frechette, Senior Vice President, Merchandising for Petco, says in the announcement, "We're thrilled to be the exclusive retailer for the memorable and fun-loving Trolls Pet Fans Collection. The vibrant, playful and positive theme of the film is a perfect match to showcase the pet and pet parent bond, and we're excited to recreate the spirited characters to make playtime more fun." The collection includes items like the Trolls Fuzzbert Teaser Cat Toy and Trolls Poppy Headpiece. There are also toys resembling the Troll characters themselves. The items range in price from $5 to $13. You can find them in Petco stores and online here on petco.com.